On May 16, 2003, President Bush filed papers with the FEC establishing a presidential campaign committee. Marc Racicot is the campaign chairman and Ken Mehlman is the campaign manager. Finance chairman Mercer Reynolds [in Spring 2004 he moved over to head RNC's Victory program], deputy finance chairman Jack Oliver, and finance director Travis Thomas led the finance team. When it closed the books on fundraising at the end of August 2004, Bush-Cheney '04, Inc. had received total receipts of over $260 million including $256 million in individual contributions. There were 1,324,206 unique contributors to the campaign, and contributors represented every county in the country (3,141 counties). Rangers, Pioneers and Mavericks played a significant role. At the same time, there were 2,045,682 total contributions under $200, and the average contribution to the campaign was $116. $130.6 million was raised through events/major donor programs; $114.6 million with direct mail/phones; and $13.8 million online. The campaign's Donor Lookup page. Texans for Public Justice has done a lot of research on the Bush campaign's big donors. Center for Public Integrity The Buying of the President 2004: President George W. Bush. * includes $671,000 transferred from three Bush 2000 campaign committees. September Monthly Report (August 2004): On Aug. 12, 2004 the campaign announced that it had received its two millionth contribution. The contribution came from Susan Oliver, a teacher in Evans City, Pennsylvania, who retired as a U.S. Army Lieutenant Colonel after 20 years of service. In August the campaign raised $18.5 million from 234,952 contributors including 81,679 new contributors. The average contribution for the month was $78. $550,000 was raised through major donor programs, $15.15 million with direct mail/phones, and $2.8 million online. June Monthly Report (May 2004): On May 20 the campaign announced it had "made history by becoming the first campaign to have the support of more than one million contributors." May Monthly Report (April 2004): May 20 Press Release: The President's re-election campaign received contributions from 183,400 supporters who gave a total of $15.6 million, bringing the total amount raised by the campaign through the end of April to $200 million." The average contribution in April was $85. April Monthly Report (March 2004): April 20 Press Release: "In March, Bush-Cheney '04 raised $26.1 million from 272,700 contributors and added 199,225 new donors. The average contribution in March was $92." President Bush headlined seven Bush-Cheney '04 fundraising events in the month, bringing in $8.8 million. The campaign's website showed that as of March 31, 2004 there were 208 Rangers (raise a minimum of $200,000) and 304 Pioneers (raise a minimum of $100,000). The campaign's report showed an astounding $49.6 million in expenditures for the month of March; much of that went to television advertising designed to define Sen. Kerry. March Monthly Report (Feb. 2004): March 19 Press Release: "In February, Bush-Cheney '04 raised $13.7 million from 129,000 contributors and added 90,000 new donors. The average contribution in February was $104." Also, the campaign's website showed that as of February 29, 2004 there were 187 Rangers (raise a minimum of $200,000) and 268 Pioneers (raise a minimum of $100,000). February Monthly Report (Jan. 2004): February 20 Press Release: "In January, Bush-Cheney ’04 raised $12.8 million from 71,000 contributors and added 50,000 new donors. The average contribution in January was $175. Year End 2003: The campaign raised $130 million from 494,000 contributors. The campaign reported $100 million was raised through events, $27 million with direct mail/phones, and $3 million online. Average contribution was $211. The campaign finished the year with $99 million in cash on hand. For the year 2003, President Bush did 42 fundraising events, Vice President Cheney 34, First Lady Laura Bush 13, Lynne Cheney 3, and Commerce Secretary Don Evans 4. 4th Q 2003: The campaign rased $47 million in contributions from 288,000 contributors of whom 232,000 were new contributors (did not contribute in the second or third quarters). The campaign reported $32 million was raised through events, $14 million with direct mail, and $1 million online. Average contribution for the quarter was $146. During the 4th Quarter, President Bush did 19 fundraising events, Vice President Cheney 15, First Lady Laura Bush 6, Lynne Cheney 3, and Commerce Secretary Don Evans 4. 3rd Q 2003: Bush-Cheney '04 fundraising continued breaking records, bringing in $49.5 million in contributions from 262,000 contributors in all 50 states and in 3,115 out of 3,141 counties. Total receipts were $50 million. Of the $49.5 million, the campaign reported $41.1 million was raised through events, $7.9 million with direct mail, and $1.4 million online. The campaign finished the quarter with over $70 million in cash on hand. 2nd Q 2003: The Bush-Cheney '04 fundraising operation started off in impressive fashion, raising $34.4 million from more than 105,000 donors. The campaign sent out a fundraising letter dated May 16 to more than a million people and to others over the Internet. President Bush did seven events over a two-week period in late June that raised about $18.1 million. (Figures are from press accounts). Vice President Cheney and First Lady Laura Bush each did several fundraisers as well. The campaign reported 18 Rangers and 50 Pioneers in the 2nd Quarter. Over 200 PACs from A (Advanced Medical Technology Association) to W (Winstead Sechrest & Minick P.C.) and 33 campaign committees contributed a total of $773,550. According to the campaign, contributions came from 84 percent of America's counties. According to the Center for Responsive Politics, top states for Bush were California $4.2 million (14%), Texas $4.2 million (14%), New York $3.1 million (10%) and Florida ($3.0 million (10%). The campaign is able to raise such large sums through the process of bundling, where a top group of friends and supporters sell tickets to fundraising events. "Rangers" raise $200,000 or more; "Pioneers" raise $100,000 or more. Although it is not required to do so, the campaign has taken the commendable step of reporting Rangers and Pioneers on its website. For more insights on the mechanics of raising such large sums see the work of Texans for Public Justice. 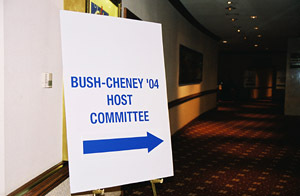 June 17, 2003--Washington Hilton Hotel.